Another canal in my neighbourhood develops disconvenient incontinence #Barbridge #narrowboat #England – The Diesel-Electric Elephant Company. …and still the swans do nothing. I walked the rubbish up to the Barbridge bins at Sparrowcough o’clock this morning, and spotted the yellow netting. I declined to investigate further, since it was not evident whether anything at all was holding up the towpath. I don’t know whether it helps or hinders that it is at the site of a sluice. The embankment here is probably twenty feet or so high. The fields behind would form a most interesting lake, should they be filled. The Bin Enclosure. It is quite similar to the Lion Enclosure at Longleat, but completely different, more boring and yet curiously more practical. I don’t know whether or not to move, really. At the moment I am one lock down on the Middlewich Branch, but it probably matters not. The stretch of Shropshire Union at risk is currently the only feed. If it breaches, we’ll all quite quickly be grounded. If they have to put stop-boards in for a few days while they fix it, we’ll all quite quickly be grounded. Yonder creeping leak is centre-stage, just to the left, south of the junction. No idea whether just chucking old filing cabinets and dead cats down the hole would be in the least effective, or whether this is a JCBs-rally-to-the-flag jobbie. I only know that the longer that water flows the more it will flow and the more it will wash away, in some sort of positive-feedback arrangement, the outcome of which would be very, very negative. Somehow the hole looks even more grim for having been surgically opened out by CaRT to a rectangle. It does seem rather that every direction I turn on the canals some part of it breaks or falls off. I do hope that it is mere coincidence, and not something that I am doing. This is most disfabulous, most disfabulous indeed. If anybody asks about this leak then please remember – I didn’t do it, it was like that when I found it. I think that some big boys broke it. The old Victorians who built these beasties did a fantastic job, building them far, far better than we ever would today, but I do fear that the canal system is crumbling at an increasing rate. This sort of thing is why the whole system needs to be a NATIONALISED and National treasure, not left in the hands of faux-private enterprise and faux-charity. Will there be a “JustGiving” appeal page to help towards this one, I wonder? Here’s a suggestion. How about, instead of spending thousands and thousands of millions on feathering the nest of our rat-like politicians (the Palace of Westminster restoration, the price of which rises by the minute), we spend some of that money on giving the canals the tender, loving, national care that they need? Perhaps – now here’s a jolly wheeze – we could bung politicians down the various breaches to block them up again? That’s an idea, surely, that has legs. Well, politics is never practical and only rarely useful. But I do think you have a practical idea of how to use the politicians. In fact if you dice them and into a sort of tetris arrangement, they could be used in all kinds of infrastructure. -sighhhhhh- Dare I ask, do you have a contingency plan, for living, should there be no more canal system, to float upon…..? It does sound as if it is getting to the perhaps-past-saving-point. Especially when it’s salvation, lies in the hands of ‘The Powers That Be’. That is of course, unless we can contrive to introduce the politicians and the chief executives and the estate agents and the lawyers and the advertising men and the insurance execs to short pieces of stout rope and tall lamp-posts first… I would suggest hanging them all by their scruples, but they have none, so necks it will have to be! Will be moving on as best can, and probably heading north, since south looks, for the moment, to be trickling off the menu! Like so much – so many actual treasures handed down to the current crop of people – things left to mend themselves…left to slowly deteriorate…only to be “seen” once too late. This is like the levies surrounding New Orleans which were basically ignored and assumed to be fine until a massive hurricane ( It was the levies that failed after the storm had passed that flooded the place). Tax money paid solely for maintenance every time you bought gas, spent on other things. In Houston, it wasn’t the hurricane that flooded the town, an old dam which worked fine until massive developments plopped themselves down on open lands that use to absorb water…city/county let developers get rich. People are so short sighted. What? Is it thought there like here: boat owners are all rich people? Such a misconception – most boaters simply choose to spend what money they have differently and do without so much to have a boat…but non boaters never see that…or want to perpetuate the misconception. Those canals are beautiful, historic and worth saving – market them for tourism…oh, out riding a bike or making videos…no one heard…. Heavens to Betsy, not even chappies leaning on spades looking into it! How long did it take that other breach to be mended? You are perfectly right, whilst they are spending Trillions on Westminster the rest of the country cracks, the whole water system/pipes are failing faster than they can be repaired and the Fat Cats across the UK are off to sunnier climes on the profits! Shocking for us peasants to have to survive whilst they are off floating their boats wherever they please! Let’s form our own party, storm Westminster whilst it’s empty and do a sit in – I shall give thought to what it should be called! Meantime, move away, make for higher ground and wait for rain! It’s a bit far to walk back just to see if anyone’s – ahem – excuse me – “looking into it”, but if there remains sufficient water then I will be mooching back in that direction. 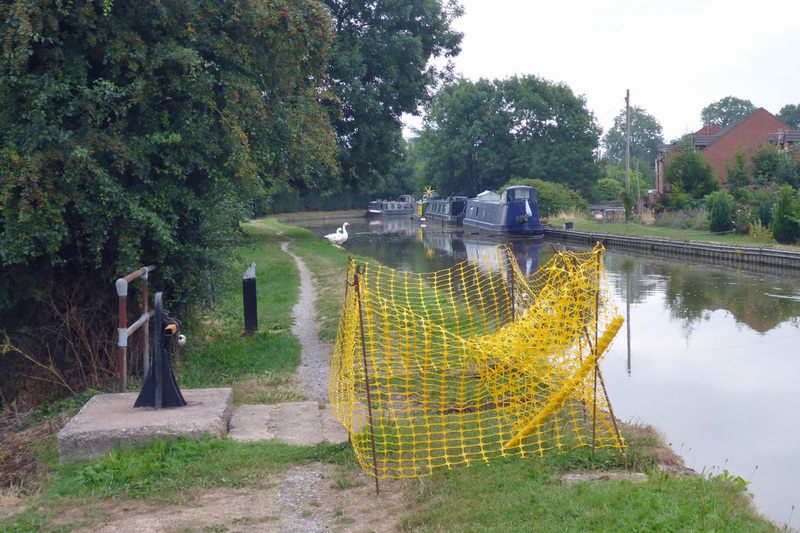 There’s no choice, the other way here is blocked by the Middlewich breach – e.t.a. on repairs for that one is “Christmas”.